We welcome you to First Presbyterian Church! You are invited to any and all services, events and activities offered by First Pres. We hope you feel the love of Jesus each time you enter here. 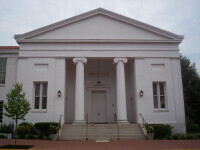 The current membership of First Pres is just over 2,200, coming primarily from a 10-12 mile radius around West Chester. First Pres is a historic church both in the church building and in the religious life of the community. Our congregation covers a broad spectrum of educational and occupational backgrounds. Many of our members serve in the professional community while others have employment with major corporations in the suburban Philadelphia area. Throughout the year we offer many special worship services that are well attended. These include an Ash Wednesday service, Maundy Thursday service, Good Friday service and five Christmas Eve services designed to minister to the entire makeup of our congregation. The music program contributes greatly to the worship experience of the entire congregation. On Wednesday evenings, there is Welcome on Wednesdays. This dynamic worship opportunity meets weekly during the school year and begins with a family style dinner, then adult Bible study and youth choir practice and/or Christian Education programs.